The week before Meatfare Sunday, the goal of the Orthodox Christian household is to consume all the meat in their home in preparation for Cheesefare Week, during which we eat all the dairy products in our household to prepare for the strict forty day fast of Great Lent. Tsiknopempti is celebrated eleven days before Clean Monday on Thursday because in the second week of the Triodion we fast on Wednesday and Friday, as opposed to the first week of the Triodion where it is a non-fasting week. It is the last day we can really dedicate to barbecuing, celebrating and eating whatever we want for nearly two months until Easter Sunday (on Friday we fast, on Saturday we go to church for the Saturday of Souls, and on Sunday we again go to church on Meatfare Sunday, though technically on Sunday we can also eat meat after the Divine Liturgy). Tsikna is the smell of charred meat, and the word Pempti means "Thursday", so the whole Greek word Tsiknopempti loosely translates to "Barbecue Thursday," and is somewhat similar to Fat Tuesday in other countries (though for Orthodox it is more extended over a little more than a week rather than one day). In the Greek tradition, Tsiknopempti (say: tseek-no-pemp-tee) is a day celebrated with great gusto. 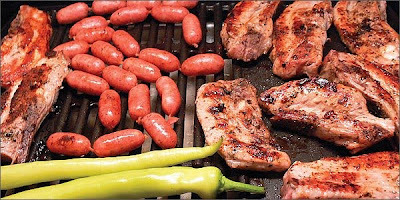 City and town governments set up grills in central squares, musicians stroll around playing traditional instruments, and great quantities of roasted meats are consumed in the midst of the Carnival atmosphere (carnival is Latin for "farewell to meat"). And it isn't only central squares in cities and towns that will be filled with the smell of fabulous meats cooking over hot coals - but backyard grills and fireplaces are fired up as well and the countryside fills with wonderful aromas. It is said that you cannot go anywhere in Athens today without smelling the aroma of meat.